Individual small RNAs are responsible for controlling the expression of gonadoliberin or GnRH (Gonadotropin-Releasing Hormone), a neurohormone that controls sexual maturation, the appearance of puberty, and fertility in adults. This has just been demonstrated by the “Development and Plasticity of the Neuroendocrine Brain” team led by Vincent Prévot, Inserm Research Director (Jean-Pierre Aubert Research Centre, Lille). The involvement of microRNAs, transcribed from DNA, occurs around birth, and marks a key step in postnatal development. Failure of these microRNAs to act leads to the disruption or even total cessation of GnRH production by the hypothalamic neurons that synthesise it, and hence to infertility. In the most serious cases, sterility may result. Details of this work in mice are published in the 2 May 2016 issue of the journal Nature Neuroscience. 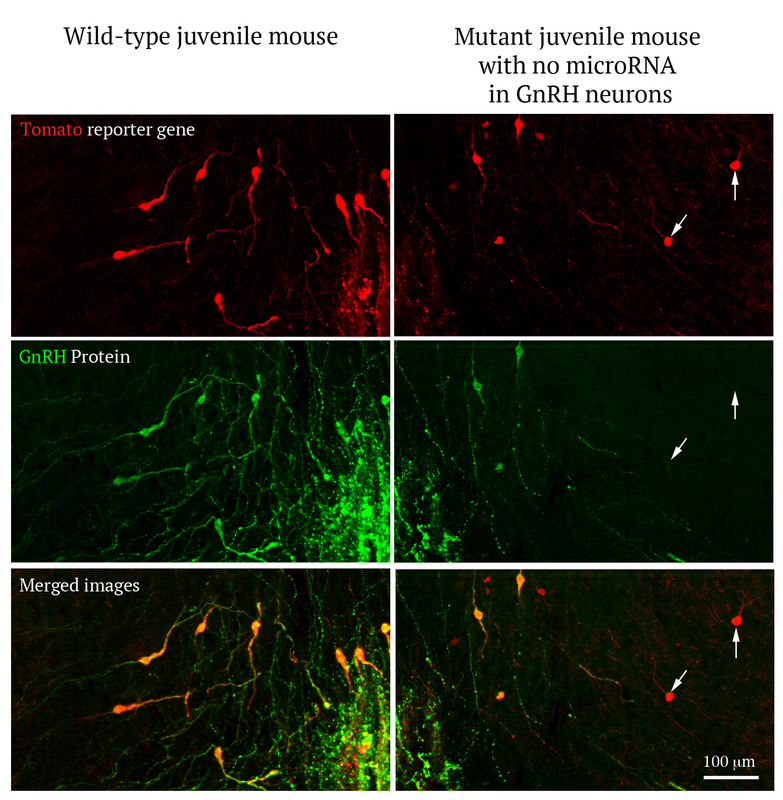 Images showing the expression of the neurohormone GnRH (green) by the hypothalamic neurons that synthetize it in mice in which GnRH neurons have been genetically tagged by the Tomato gene (gene coding for a red fluorescent protein). Reproductive function is determined by events that take place in the brain. Gametogenesis (the production of spermatozoa and oocytes) and the secretion of hormones by the ovaries and testes are heavily dependent on the hypophysis, a small gland located below the brain, to which it is connected by a capillary network. The latter is in turn controlled by a glandular “orchestra conductor” located at the base of the brain, the hypothalamus. During postnatal development, activation of a small number of highly specialised neurons (the GnRH neurons) in the hypothalamus leads to the synthesis of a hormone, gonadoliberin or GnRH (Gonadotropin Releasing Hormone), and this process leads to the appearance of puberty. This step, known as “mini-puberty” constitutes the first activation of the reproductive axis by the brain. It occurs between the first and third months of life of the infant, and is important to the correct course of sexual maturation*. At puberty, GnRH stimulates the synthesis by the hypophysis of other hormones, which in turn enter the bloodstream to promote the growth of the gonads (ovaries and testes), and to subsequently ensure reproductive function. The appearance of puberty remains one of the greatest scientific enigmas of the 21st century. In the last 30 years, the discovery of mutations in various parts of the genome in patients with disorders of puberty has made it possible to identify some genes involved in this process. 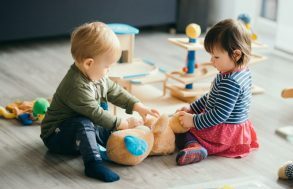 However, physicians and scientists believe that these genes are responsible for only a third of the disorders of puberty encountered in patients. The discovery of the involvement of microRNAs opens up considerable prospects for the medical management of these patients, from both a diagnostic and therapeutic point of view. MicroRNAs are small non-coding RNAs transcribed from our DNA. In contrast to messenger RNAs (mRNA), they are not translated into proteins. Because of this, microRNAs are not part of the “coding genome,” but constitute what some people call the epigenome. Regulation of gene expression, e.g. expression of the GnRH gene, by microRNAs is therefore considered “epigenetic” regulation. Research conducted in mice by Vincent Prévot’s team shows that birth induces a radical change in the expression of microRNAs in the hypothalamic GnRH neurons. This modification of the microRNA expression profile is essential to the inhibition of the expression of transcription factors (proteins that activate or inhibit gene expression) that have a repressive effect on GnRH expression. This inhibition of inhibitory factors allows increased production of GnRH, which is indispensable to infantile and juvenile sexual maturation, and the occurrence of puberty. 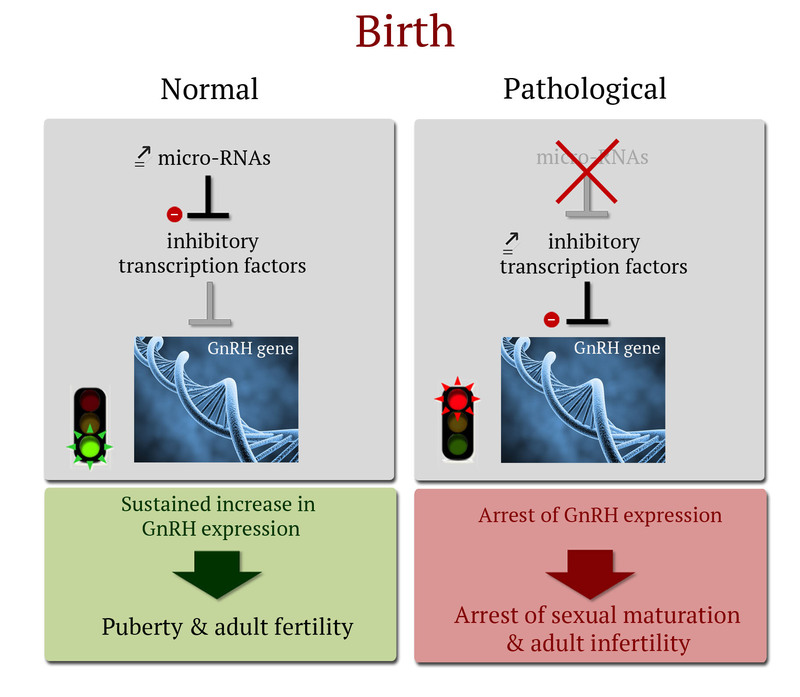 Indeed, in the absence of microRNAs, the expression of transcription factors that inhibit GnRH expression increases, and leads to the extinction of GnRH synthesis in the brain, leading to the arrest of sexual maturation, absence of puberty, and complete sterility in adult individuals. Analysis of the GnRH gene in humans shows that analogous phenomena might occur in our own species. The mechanism elucidated by this team might therefore explain the absence of puberty and the occurrence of infertility in some patients for whom no mutation or polymorphism (variation in DNA sequence) has been identified in the coding genome. In terms of diagnosis, the study carried out by Vincent Prévot’s team in Lille shows the interest of analysing DNA segments from which microRNAs are transcribed, as well as the genome segments that encode their binding sites on the target genes. “The work published today shows the importance of studying the genome sequences that will be transcribed into mRNA molecules, to which microRNAs bind in order to regulate their translation into protein,” add the researchers. From a therapeutic standpoint, the interaction of microRNAs with the genes they regulate may be prevented or mimicked by the administration of small analogous molecules, for which the study done by Vincent Prévot’s team provides proof of concept. 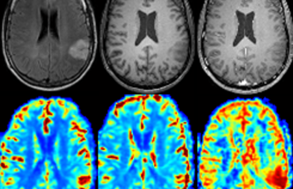 This research received financial support from the French Medical Research Foundation (FRM). * This mini-puberty is seriously compromised in premature infants, who are more likely to develop disorders of puberty and adult infertility than infants born at full term.